Pictured are (from left) Zachary Senzer, Lori Pollock and Ryan Serva. 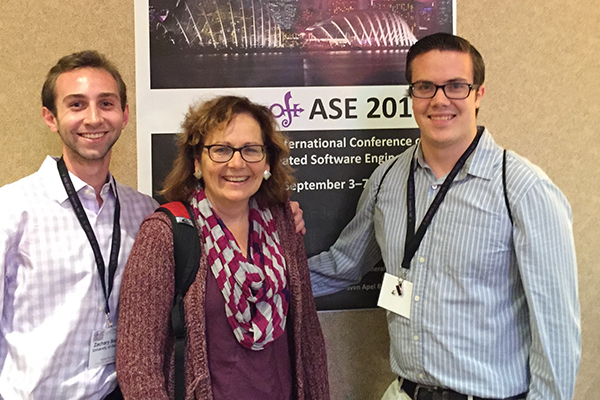 10:50 a.m., Jan. 6, 2016--University of Delaware junior Zachary Senzer and senior Ryan Serva recently presented a research paper, “Automatically Mining Negative Code Examples from Software Developer Question and Answer Forums,” at the Fourth International Workshop on Software Mining in Lincoln, Nebraska. The paper was also published in the proceedings of the 2015 IEEE/ACM 30th International Conference on Automated Software Engineering Workshops (ASEW 2015). Their research demonstrates how natural language processing and sentiment analysis techniques can be used to mine bad, or negative, code examples from software developer forums to be used to help programmers in their learning and code improvement practices. Lori Pollock and Vijay Shanker, both professors in the Department of Computer and Information Sciences and co-authors of the paper, mentored Senzer and Serva in their research. Senzer, an Honors Program student who is majoring in computer science with a minor in business administration, has been working with Pollock and Shanker at UD’s Software Analysis and Compilation Lab since February 2014. Serva’s research experience complements his internship experience at Amazon, where he will be taking up a position after graduation in May. The research was supported by the National Science Foundation and the University of Delaware Undergraduate Research Program.